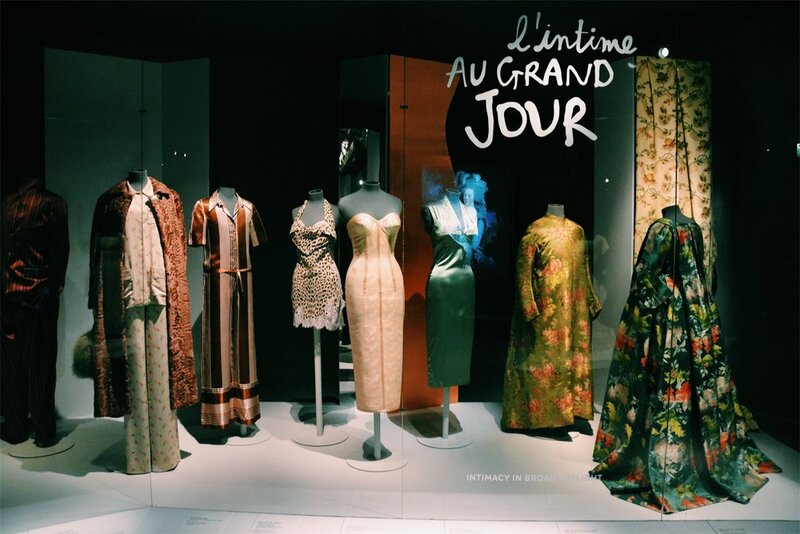 I visited a fascinating exhibition at the Musée des Arts Décoratifs—Required Conduct: When Clothing is a Scandal. It reviews a few centuries of Western history to reveal the inextricable linkages between "scandalous" clothing and social change. The moral of the story being that we have a long history of pushing the boundaries in fashion as a means of pushing harder-to-move societal boundaries, including gender rules and norms around decorum and social conduct. “How should we dress?” This [is] the question this exhibition tries to answer, shedding new light on the questions raised by dress codes and the values and taboos they reveal...Featuring more than 400 garments and accessories, portraits, caricatures and objects, this original and unexpected exhibition explores the liberties taken with dress codes and how they breached moral values. The robe volante, women in trousers, men in skirts, female tuxedo, miniskirt, baggy, jeans… All challenged vestimentary norms and were savagely criticised, even banned when they first appeared. Because they were too short or too long, too close or too loose fitting, too immodest or too covering, too feminine for men or too masculine for women, they transgressed the established order. First, what constitutes scandalous clothing? One inclusion, for example, was women in pants, a concept championed by Coco Chanel in the 1920s. Chanel's looser fitting silhouette, and her philosophy on pants in particular, gave women the clothing they needed to move freely and efficiently; tools they would ultimately use to join the workforce and upend gender norms as they did in the mid 20th century. From the beginning, Chanel's designs reflected the aspirations of women and their changing lives...Her new women drove cars, wore pants, and ran companies (as she herself did). After World War I women began to lead freer, less circumscribed lives, and her fashions, masterfully cut and easy moving, enabled them to do so. Contrast that to fifty or so years earlier, when women of a certain social class were expected to wear a different dress for every activity they undertook in a day. According to the exhibition, it was common for women to change up to eight times each day. Below, a sample of dresses, including at least one dress (on the left) from the couturier Charles Fredrick Worth c. 1890. 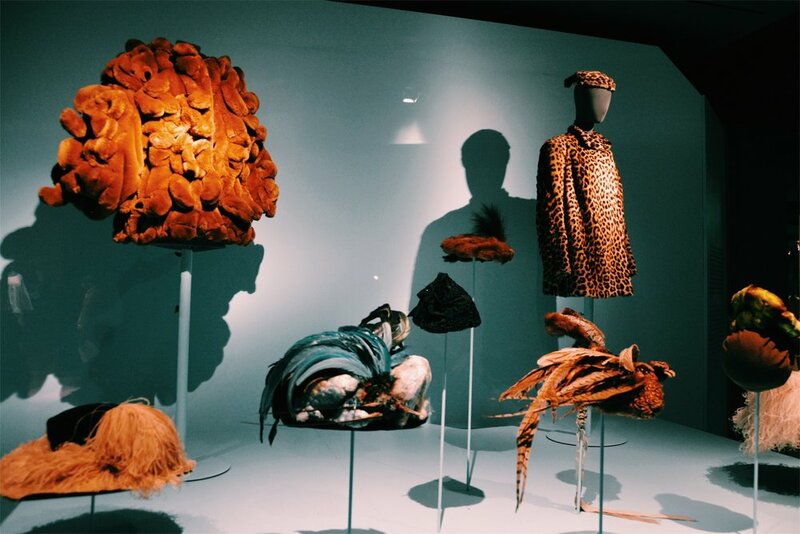 Another display from the exhibition featured hats, and a description referenced the controversy raised by women's hats and headpieces in the late 1700s, but not for any reason I would have guessed. At the time, it was fashionable for women to wear very high, exaggerated things on their head, a fashion which was heavily mocked. Underlying this criticism, though was, "the real transgression [which] was against the spatial order: women were taking up more 'space' and posting a threat to masculine power" (quote from a description posted in the exhibition). Something else I found interesting was the inclusion of garments marking special occasions in the Christian tradition, such as weddings, baptisms, and death. Below, a sample of clothing associated with such occasions, including a stunning silk Vionnet wedding dress and mourning clothes (in the right corner). In his will, a married man stipulated his expectations for how long he would be mourned, with specific instructions pertaining to the length of time his widow would be required to wear formal mourning clothes. 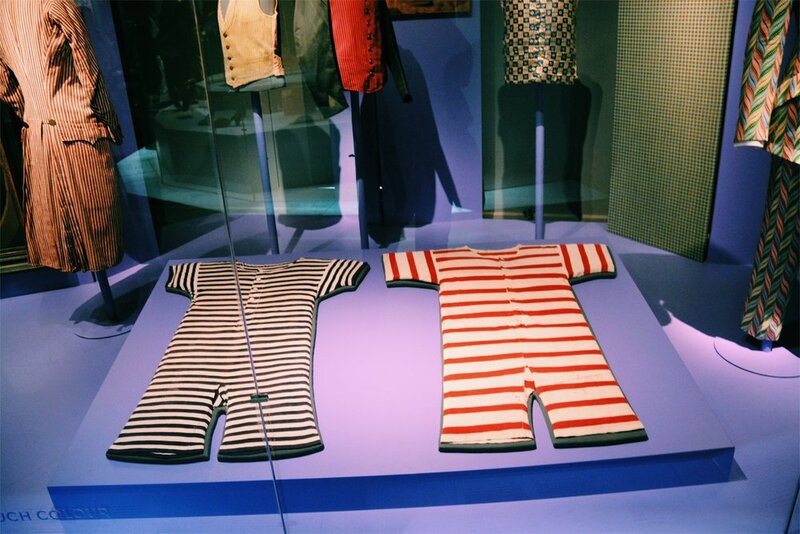 The exhibition featured many other instances of clothes pushing social boundaries, including flapper dresses (which ditched the corset), bedroom attire becoming acceptable in public, stripes (once reserved for social outcasts), loose-fitting clothing, clothing with deliberate flaws, short clothes, animal furs, skins and prints, and transgressive runway fashion. Considered alone, any one of these items of clothing could seem benign, even frivolous; maybe begging the question, "So what?" But once something catches on, and we all start expressing ourselves through a more relaxed silhouette, or a more gender-neutral one, or something extravagant, or revealing, what appears is anything but frivolous: we witness the power of fashion to mirror our values and reflect both our understanding of our current social realities and our hopes for what our society might look like in the future. Whether we're aware of it or not, fashion is always reflecting our values right back at us. The tendency to see it as superficial does this fact such a grave injustice. Fashion is a mirror for what a society thinks and feels, for what it values and respects. For what it believes to be true. Whether we're considering the appropriateness of Melania Trump's congressional sequins, or asking if it's legitimate for a female Prime Minister to care about fashion, what we're ultimately doing is simply using our clothes as a proxy for our values. This exhibition was a tactile reminder of that. Fashion inevitably changes. But its inherent power has always been exactly the same. Tenue correcte exigée, quand le vêtement fait scandale- through April 23, 2017. - Koda, Harold, Andrew Bolton, and Rhonda K. Garelick. Chanel. Metropolitan Museum of Art, 2005. - Tenue correcte exigée, quand le vêtement fait scandale. Les Arts Décoratifs 107, rue de Rivoli, 75001 Paris. 28 March 2017.